COMING SOON FROM SEQUENTIAL PULP & DARK HORSE COMICS! 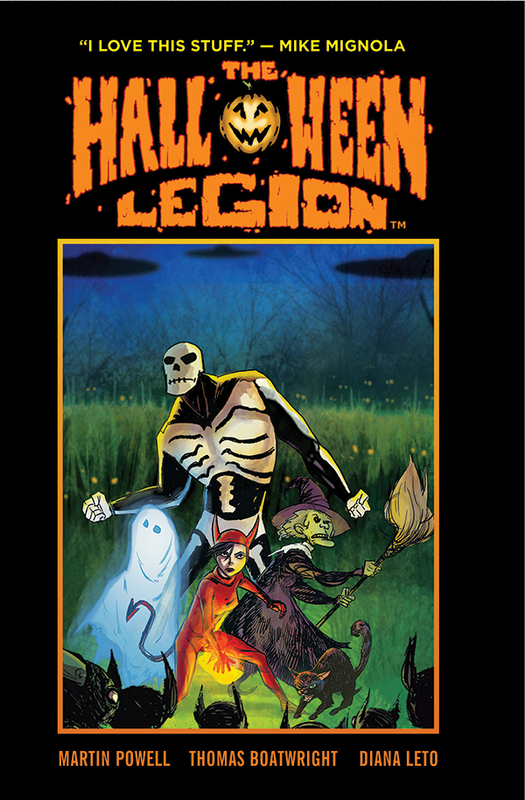 Dark Horse Comics and Sequential Pulp Comics proudly announce THE HALLOWEEN LEGION, a new graphic novel written by Martin Powell (MARS ATTACKS POPEYE), illustrated by Thomas Boatwright and Diana Leto. The sleepy rural town of Woodland is protected by a mysterious group of extraordinary guardians. They come from a place of eternal October, where orange, gold, and crimson leaves follow you in the autumn breeze. THE HALLOWEEN LEGION characters, The Skeleton, The Witch, The Ghost, The Devil, and Autumn the Black Cat, are the creations of writer Martin Powell and illustrator Diana Leto, who share a passion for All Hallows Eve. Also, included in the full-length graphic novel is Martin Powell’s autobiographical “Once Upon a Halloween”, illustrated by Diana Leto. The eerie tale is, according to Powell, his very own origin story. THE HALLOWEEN LEGION has already developed an enthusiastic fan base with no less than Mike Mignola cheering them on. “I love this stuff,” says the HELLBOY creator. Evil beware – The World’s Weirdest Heroes are here!